CED, BRACU proudly presents the team titled â€œProject: Enlightened Humanâ€ who has won the BRACU/NYU Reynolds/D-Prize Social Venture Competition 2016.The program titled â€œBRACU/New York University Reynolds Program in Social Entrepreneurship (NYU Reynolds)/D-Prize Global Social Venture Competition Consortiumâ€ was organized during second quarter of 2016. Top universities around the world have joined together to conduct their own intra-school competitions and support their students’ efforts to scale sustainable, proven poverty solutions in the developing world. The consortium does more than providing students a chance to launch a world changing venture. It also pools university resources, encourages shared value and curriculum, and multiplies the power of each university. 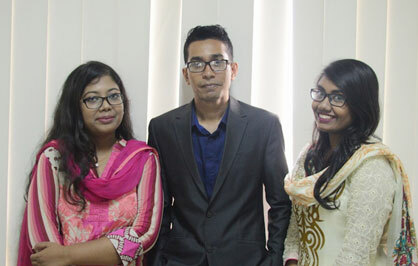 This year, a group of 3 innovative youths from BRAC University have come up with the idea to change the mainstream teaching and learning method of Primary Schools (grade 1-5th) (Full govt., half govt., private kindergarten, community, NGO- and NPO-run schools) operating in Bangladesh by developing a smart curriculum which will be a blend of Flipped Classroom and academic content delivered through trained facilitators. This innovative idea was coined as â€œProject: Enlightened Humanâ€ which was selected as the winner of 2016 from BRAC University. The team would receive a funding of USD 10,000 to be borne jointly by BRACU and D-Prize.The group had to compete with other 5 innovative ideas submitted by BRACU students. As a managing partner of this great initiative, BRAC USA and Centre for Entrepreneurship Development (CED) of BRAC University would like to congratulate the team for this remarkable success and wish them the timely establishment of their commendable social venture.